Does S3 Media Maestro have any documentation? We have several resources to provide you with instruction on how to use S3 Media Maestro. Documentation is provided within the WordPress admin panel. 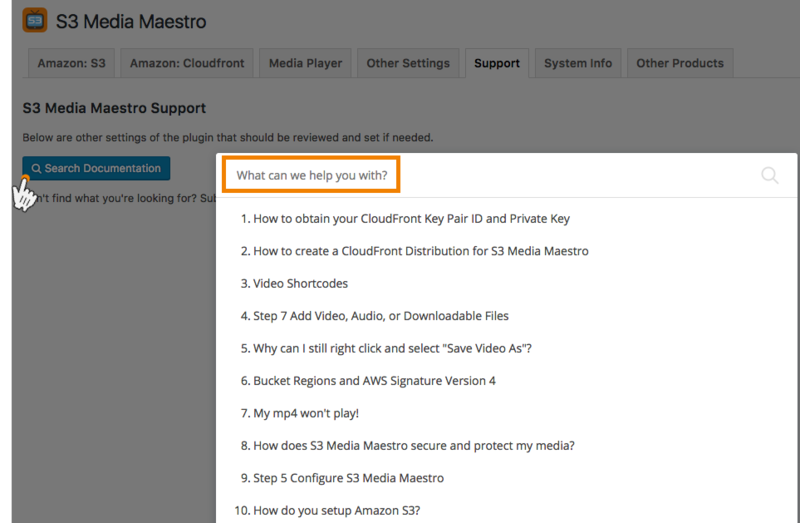 Click Settings→S3 Media Maestro, then click on the Support tab and click Search Documentation. Type your issue into the text box to search our knowledgebase. You can also view these same articles on the support knowledge-base. We have a YouTube Channel with all of our instructional videos. Don't forget to check out our demo site to see S3 Media Maestro in action. If you still can't figure out how to do something, feel free to submit a help request from within the Fly Plugins Member Portal.